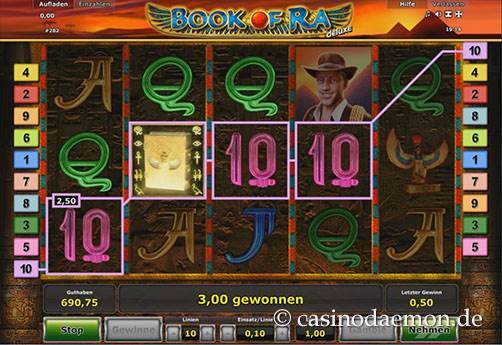 Book of Ra Deluxe from Novomatic is one of the most successful Egyptian-themed slots offered in gaming halls and online casinos. This game is the Deluxe version of the original game Book of Ra and the difference lies in the number of pay-lines, the return to player rate and the graphics, which are a little more modern than in the original game. The story is the same, and you can join the adventurer on its quest to find treasure inside the pyramid. Although the graphics are nice, the sound effects are the standard sounds of the Novomatic slots. 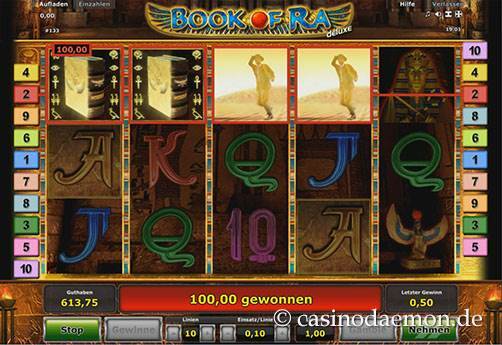 The game with the Egyptian theme offers a wild and scatter symbol, as well as free spins with a special bonus symbol. 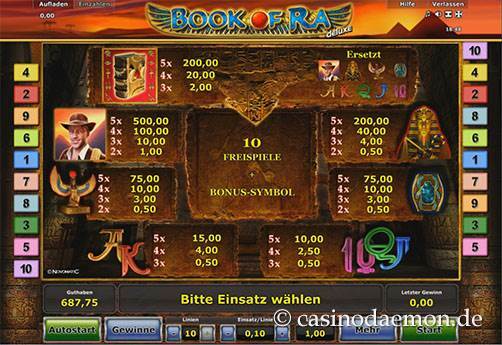 Some casinos also offer a Book of Ra Deluxe Jackpot version of the slot that offers a progressive jackpot. The variance of the slot is low to medium, and you should regularly get winning combinations. Most money can be won with the bonus symbol in the free spins. The theoretical return to player is 95.1%, which is slightly below average for an online slot. You can also play Book of Ra Deluxe mobile, as the game is optimised for many mobile devices. You can play Book of Ra Deluxe for free on this page and try the game without obligation of having to spend real money. If you like it, and want to play it for real money, you can find it at one of the listed online casinos on this page. The special symbol in the game is the book, which is a wild and a scatter symbol, and it can stand in for other symbols for winning combinations. It pays out with a minimum of three symbols and it also starts the free spins. You will get 10 free spins, but before they start one of the symbols will be randomly chosen as the special bonus symbol. After the winnings of a round have been paid out the bonus symbol can randomly expand on the reels and create even more winning combinations, also because it doesn't have to appear on a pay-line, winnings are paid out as scatter wins. You can also risk the winnings of normal game rounds in the gamble feature, and you can try to double them - even multiple times in a row - in the card gamble, by guessing the correct card colour. 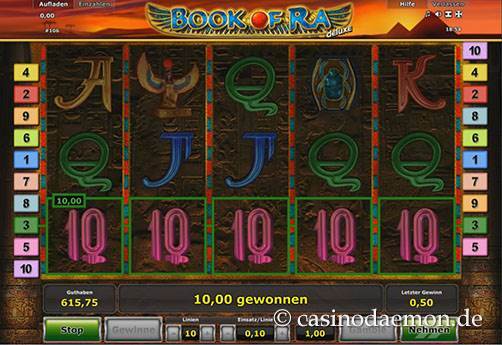 The Book of Ra Deluxe slot has 5 reels with 10 variable pay-lines. You will have the best chances of winning when activating all 10 lines. You can play the slot with coin values between 0.01 and 10 £/€/$, which means the minimum you have to bet in one round of 0.01 £/€/$ for one activated line, 0.10 £/€/$ for all activated lines, and you can play a maximum of 100 £/€/$ per round. Automatic play is also possible.